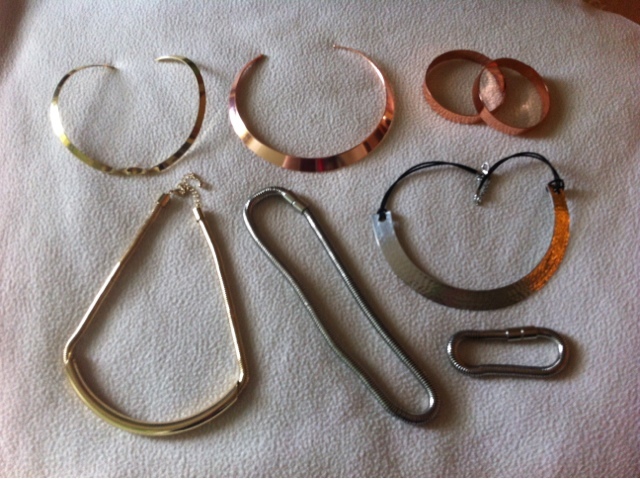 I have recently become slightly obsessed with jewellery, particulary h&m jewelry. I first got into collared necklaces after seeing the silver one in river island a few months ago and I loved it. So when I saw the rose gold one in h&m a few weeks later I knew I had to have that one aswell. So me and the two necklaces were getting on great and even enjoyed a lovely holiday to spain together. Well after the lovely holiday I ended up in h&m again. I was looking at all the jewellery as I had seen the sliver chain and bracelet in a haul on Brabara's channel and fell in love. Whilst looking for the set I found the rose gold bracelets, and I couldn't just buy one, oh no I had to get two! Well since I had built up my rose gold and silver collection I thought I better start a gold one. I was in a dilemma of which gold necklace to get so I asked my mum, she liked the collar with the twist the best, I liked the chain detailed one. So I compromised and got both. Yes I have a problem. I am currently looking for a h&m jewelleryaholics anonymous as I type, surely I can't be the only one who has fallen victim to the wide range of accessories available at h&m. Now story time is over I am going to get onto the good stuff. I really love how these simple necklaces can dress up causal outfits such as white-tee's, plain dresses and I just love layering them under shirt collars. I also like mixing the metals which is something I would have hated just a few months back. I posted a outfit snap on my instagram and twitter (@beckywolly) a while back of me wearing the sliver and rose gold bracelets together and I really liked it. I would really recommend these pieces for a cheap update to your wardrobe, although I would be careful with the chain and bracelet set as they are magnetic so the bracelet falls off easy, I manged to break mine - although this is nothing new, I break everything. Those are really nice! I love H &m!! If you have time, could you check out/comment/ follow my blog too please? These all looks so beautiful! I love the rose cold cuffs. In my opinion rose gold is really pretty, much better than the usual gold. H&M have been doing some really great stuff lately! So happy to have found your blog, cant wait to see more!